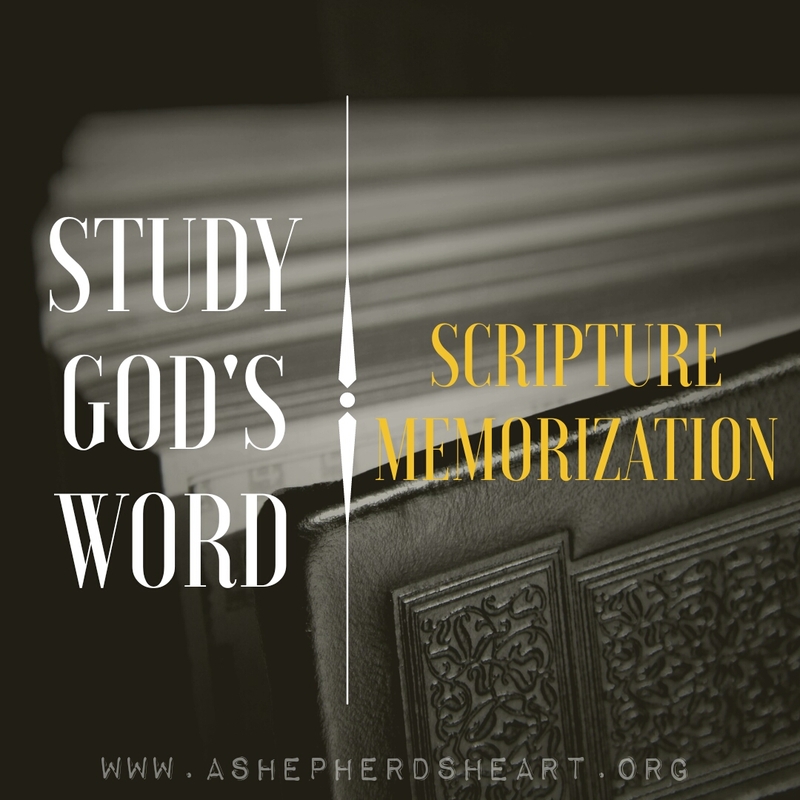 A Shepherd's Heart: The Bible is Essential Part 3 - Scripture Memorization and Tips. 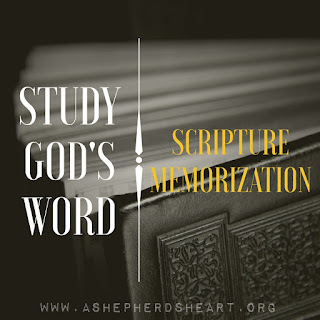 The Bible is Essential Part 3 - Scripture Memorization and Tips. In the last communication we took a look at studying God's Word, specifically Bible Study methods as an important part of making God's Word a priority. In this communication we're shifting our focus to the importance of scripture memorization in the life of a follower of Christ. We're reminded of the importance of God's Word by a question from Psalm 119:9, "How can a young man keep his way pure? By guarding it according to your word" and then in Psalm 119:11 that, "I have stored up your word in my heart, that I might not sin against you." So how do you "guard your ways according to God's Word" and how do you "store up His Word in your heart?" One way is summed up in these three word: Memorize God's Word! It doesn't matter what age you are, we're all capable of memorizing scripture and need to incorporate it into our lives for our benefit and the benefit of others! Abiding in The Word through reading, studying, memorization and living it out are vital keys to our growth. If you took an inventory of the activities you do, from binge watching TV shows or movies, spending time on social or anything else, you'd see that you spend a considerable amount of time on many things...and you can make time time to spend a few minutes working on scripture memorization. Do you ever have to wait for a Doctor's appointment? Do ever have to wait for laundry to finish it's cycle? Do ever have to wait for a something to finish cooking in the oven? Do you ever have to wait for your child or children to finish school or an appointment to pick them up? Do you eat breakfast or lunch? Do you ever walk to work or to a class? Do you have a personal time of devotion? If any of these things and more apply...you have time to spend a few minutes memorizing scripture. You're growth is your responsibility and scripture memorization is one of the many tools that we're all responsible to use for our own benefit and the benefit of others. If you can give directions from your home to the closest gas station.. If you can do all these things from memory...you can memorize Scripture! No matter what excuse we can concoct, we have to move from making excuses to making memorization a priority! Anything that's worthwhile takes work and a commitment to it and above everything else, God and His Word deserve our all! Years ago when I was younger in the faith, I was first introduced to scripture memorization by someone who has played a very important role in my growing in my faith as a disciple of Christ. He is long time missionary and pastor, my Uncle Bill Kramer who as since retired. Whether he realized it or not...he has discipled me in many ways! He spoke God's truths into my life many times and provided me with knowledge and tools, such as scripture memorization, that have greatly impacted my life. I've varied my scripture memorization from a verse to an entire chapter on up to an entire book! What I find amazing is that more often than not that in speaking with someone or in times of trial or in general, God brings the scriptures I've memorized to mind to share with someone else or speak to myself. Pray - prayer is a vital key to successful memorization. Pick verses you want to memorize. Keep the context of the verse in mind. Choose a consistent time or times that work for you. Say it out loud repeatedly. Write it out if that helps. Repeat steps 6-7 or 6 or 7 until you have memorized the scripture you're working on. Review the verse or verses regularly. Don't make it a stressful thing...don't stress out! Don't make it a legalistic thing...scripture memorization should never be approached in a legalistic manner. Note Cards: Super easy to write a verse per card and take with you. Business Card Size: Super easy to grab a template in your favorite office type program, type verses in the template, one per card, and then print out the cards to take with you. Sticky Notes: I've seen some who write verses on sticky notes and the place them in various places around the house, the car, etc so they can work on and review the verses they are memorizing. Topical Memory System: I highly recommend checking out the Topical Memory System that The Navigators organization created. You can find out more tips about scripture memory and in the available PDF file they offer, they mention here TMS that I've used in the past. Put the verse on your phone lock screen or computer background. There are also applications apps for Scripture memory that you can check out in your favorite app store. Music: Some people enjoy memorizing to music. Either their own tune or some other existing tune. If you're like me, as much as I appreciate and use apps, I still prefer the analog form which utilizes the Bible, note cards, or business card size paper. I find having something tangible that I can take with me is very helpful. No matter what you land on, I hope you're encouraged by this information and will give Scripture memorization a try and eventually make it a regular priority as it is and will be a great benefit to your life and walk with The Lord!